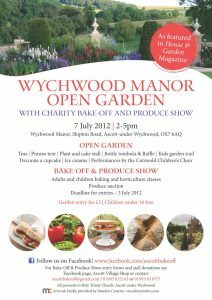 Open Gardens and Charity Bake-Off and Produce Show at Wychwood Manor, Shipton Road, 7th July 2012, 2.00 pm – 5.00 pm. Wander around the immaculately manicured lawns, pristine borders and the stunning walled vegetable garden of Wychwood Manor as featured in the June issue of House and Gardens magazine. Enjoy a Pimms, visit the plant stall or sample the homemade cakes while listening to the Cotswold Children’s Choir. And there’s more… Show off your best blooms and vegetables, plus take part in the first Ascott Bake Off, with classes for children and adults alike.